On June 6th in 1965, Cameron Michael Neely was born in Comox, BC. Blessed with the rare trifecta of size, talent and toughness, Bam-Bam Cam became the NHL's prototypical power forward. 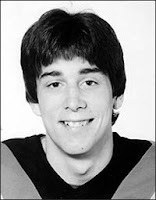 Selected 9th overall in the 1983 Draft, Neely spent three seasons with the Canucks before Harry Neale sent him to Boston on his 21st birthday with the club's 1987 first round draft pick (Glen Wesley) in exchange for Barry Pederson, the worst trade in franchise history. Neely would collect 395 goals (395G/299A/694Pts) in his 726 game 13 year career, including three 50+ goal seasons ('90, '91, '94), placing him 15th overall in goals per game. Despite his Masterton winning perseverance (1994), Neely never recovered from a pair of Ulf Samuelsson-induced injuries in the 1991 Wales Conference Finals, finally buckling at the age of 31. In 2005, Neely was inducted into the Hockey Hall of Fame, a year after having his number 8 jersey raised to the Boston rafters. Today he serves as Vice President of the Bruins, a position held since 2007. Away from the rink Neely focuses on his Foundation, helping cancer patients battle the disease that took his parents, and appears in TV (Cheers, Rescue Me) and film (Dumb & Dumber, Me, Myself and Irene), most famously as the Farrelly brothers' recurring tough guy Sea Bass. That's today in NHL history.